Need a costume for your benefit auction? Here's a coupon. You are here: Home / Blog Post / Do guests wear costumes to your auction? Here’s a coupon. I like to share deals when I find them, and here’s one that caught my eye. 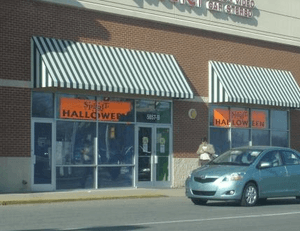 Spirit Halloween sells product online, but the company also sets up temporary storefronts which appear a few weeks prior to Halloween and disappear shortly after October 31. Some benefit auction themes encourage guests to wear a costume. If your auction is the type of event that will have guests wearing costumes, this might be a store worth browsing. They may also have decor elements you could use, depending on your theme. I mention this store now — in the middle of summer — because they recently emailed me a deal. They’re offering a 25% coupon to anyone who submits location ideas to them via their website. If you’d like the company to consider setting up a temporary store at a location near you, here’s your chance to make a suggestion and receive a coupon. Guidelines are on their Website. You’ll need to send the company the suggestion .. not me. You can click the link and follow their guidelines to give your idea (and see if they are ready for international expansion). Good luck!